At the end of my annus mirabilis, I published a response essay in Reading Skin in Medieval Literature and Culture (ed. Katie Walter), a new Palgrave anthology with pieces by Lara Farina, Bob Mills, Julie Orlemanski, Elizabeth Robertson, Susan Small, Isabel Davis, Katie Walter, and Virginia Langum. Happy to see so many friends of the blog in that list. Look to this anthology for work on Blemmyes, on Havelok, on werewolves, as skin and time, on the philosophy of medicine and probing,on the Testament of Cresseid. And look for me doing work that I kept from this blog, and more’s the pity, because, as you’ll discover, I fumbled. How hard I fumbled is up to your judgment. “If skin is a membrane, bidirectional plane of contact, or container, then we need not think of skin only in an organic sense or, for that matter, only as delineating the borders of a conscious subject. Skin rather should be understood as being everywhere things persist, meet, or are. Skin intervenes in any encounter. Skin establishes difference, an ‘interval.’ It mediates while confounding absolute immediacy” &c.
Too much “academic mumblespeak” and other bad prose habits there (thus, at once, rather, to which I would add), but otherwise not so bad. No (major?) errors. Except that’s not what’s happening. Not exactly. I was at the Met yesterday to see James Nares’ extraordinary film “Street” (a must-see for all thinkers interested in scale and time), where I also saw this plaque among the objects Nares had selected “to provide different points of entry into aspects of his work.” The plaque’s about traveling, about visitation, about surprise, about touching and not touching, and about silence, since a plaque can only represent speech without actually giving it voice. It’s about how this film about just looking also must be a film about touching. We’re not simply conducting surveillance. The cries of delight when birds crossed the screen, when New Yorkers loved seeing, of all things, a pigeon (! ), was proof enough of that. But if you look at the plaque from the left, Christ isn’t actually touching Mary’s halo. His fingers stop just before it. Or they’re floating just above it. Foiled! Or so I thought, until Alison rescued me by pointing out that Christ’s fingers do penetrate her halo, so long as we’re looking from the right. We have a host of lessons here. I can give you two, and invite you to list more. The first: don’t write about a sculpture until you’ve actually seen it. I wrote my essay in Paris, not New York, and should have written about something, oh, at the Louvre or the Cluny. The second: don’t forget anamorphosis, particularly with sculpture, which are, if we work with them properly, moving images. 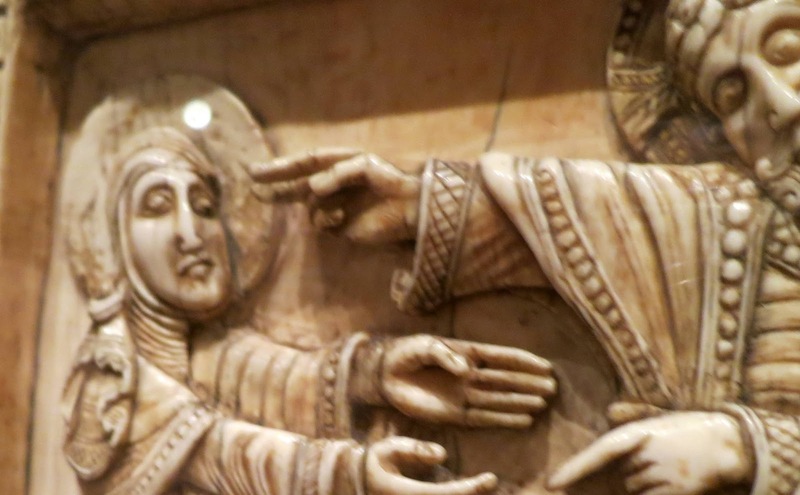 This plaque invites us, requires us, to move around the scene, so we can realize that, depending on the lighting, depending on our stance, we’re going to see the touch Christ tried to prevent. And we’re going to miss that touch so long as we don’t let the sculpture move us around it. And for more on such things, see Asa Mittman. 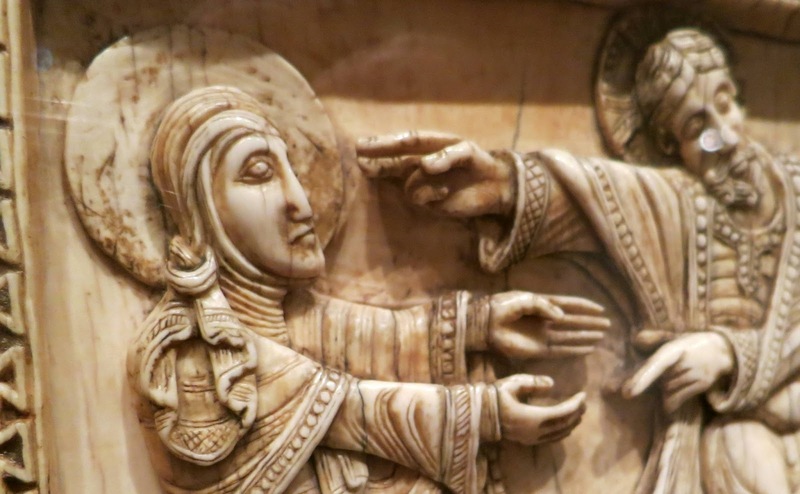 This entry was posted in MedievalBlog and tagged art, fumblr, Mary Magdalene by medievalkarl. Bookmark the permalink.